In cancer and in chronic viral infection, CD8 T cells are kept in an inactive state by signals through PD-1. But this is only the start of the story. 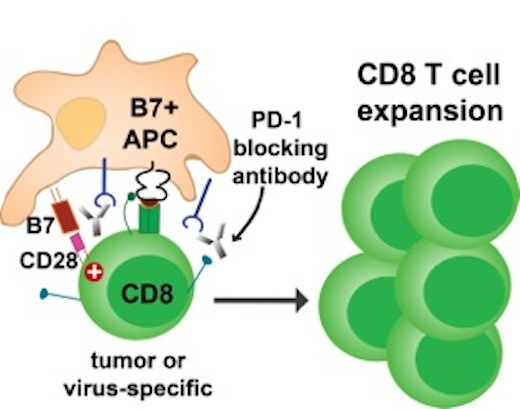 Even if PD-1's inhibition is blocked by drugs, CD8 T cells need "fuel" in the form of stimulation through CD28 to proliferate, Emory Vaccine Cancer and Winship Cancer Institute researchers show. The findings suggest CD28 as a predictive biomarker and have implications for combination therapies. Illustration courtesy of Alice Kamphorst and Rafi Ahmed. Drugs blocking the PD-1 pathway - known as checkpoint inhibitors - are now FDA-approved for melanoma, lung cancer and several other types of cancer. These drugs are often described as "releasing the brakes" on dysfunctional T cells. A new study from Emory Vaccine Center and Winship Cancer Institute researchers shows that even if the PD-1-imposed brakes are released, the tumor-specific T cells still need "fuel" to expand in numbers and restore effective immune responses. That fuel comes from co-stimulation through a molecule called CD28. The results were published online by the journal Science on Thursday, March 9, 2017. Despite the success of PD-1-targeting drugs, many patients' tumors do not respond to them. The study's findings indicate that CD28's presence on T cells could be a clinical biomarker capable of predicting whether drugs targeting PD-1 will be effective. In addition, the requirement for CD28 suggests that co-stimulation may be missing for some patients, which could guide the design of combination therapies. "Many studies have assessed expression of inhibitory receptors on exhausted CD8 T cells, but positive co-stimulatory molecules have not been a major focus," says senior author Rafi Ahmed, PhD, director of Emory Vaccine Center and a Georgia Research Alliance Eminent Scholar. Ahmed adds: "We have recently defined the stem-cell-like subpopulation of T cells that can be reinvigorated by PD-1 targeted therapy. Now we demonstrate that in addition to PD-1 blockade, these cells also require co-stimulatory signals through CD28 to proliferate and differentiate into killer cells. We believe this increase in the number of killer cells is important for successful immunotherapy." In the Science paper, Emory Vaccine Center scientists conducted experiments in mice in which they showed that antibodies blocking CD28's interactions with its partner B7, or genetic deletion of CD28, prevented the proliferation of T cells in response to anti-PD-1 agents. The requirement for CD28 was shown in mice with chronic viral infections and mice grafted with colon cancer cells. To assess the importance of those findings for cancer immunotherapy, the researchers teamed up with physicians from Winship Cancer Institute, led by Winship's deputy director Suresh Ramalingam, MD, to analyze samples from lung cancer patients being treated with PD-1-blocking drugs. They monitored T cell responses in patients' blood and found that most of the CD8 T cells proliferating after PD-1 blockade expressed CD28. Yet, in biopsy samples from early stage lung cancer patients, the proportion of CD28-positive cells among tumor-infiltrating CD8 T cells was variable, ranging from 20 to 90 percent. These results suggest that only a subset of tumor-specific CD8 T cells will proliferate after PD-1-directed therapy, Ahmed says. "We observed that in tumors from lung cancer patients, many of the infiltrating PD-1+ CD8 T cells do not express CD28, and thus according to our data from experiments in mice, those CD28-negative cells may not proliferate when the PD-1 pathway is blocked," says lead author Alice Kamphorst, PhD, a research associate in Ahmed's lab. She adds that the requirement for CD28 co-stimulation points to the importance of nearby antigen-presenting cells providing CD28's partner molecule B7, which is not present on most tumor cells. The research team is now studying whether CD28 levels on tumor-specific T cells can predict the strength of lung cancer patients' response to PD-1-based drugs or their survival. "Our study sets the stage to evaluate CD28 as a predictive biomarker for patient selection for immune checkpoint inhibition in patients with cancer, and also paves the way for combination therapy approaches that might result in enhanced effectiveness of immune checkpoint inhibition," says Ramalingam. "We are conducting clinical studies at Winship Cancer Institute to confirm our findings in patients with lung and other cancers." Emory and Winship co-authors include associate professor Taofeek Owonikoko, MD, assistant professor Rathi Pillai, MD, research associate Andreas Wieland, PhD and assistant professor Koichi Araki, PhD. Collaborators from NIAID (the National Institute of Allergy and Infectious Diseases), Massachusetts General Hospital, Harvard Medical School, Dana-Farber Cancer Institute, and the University of Minnesota contributed to the paper. The research was supported by NIAID (R01AI30048, P01AI056299, P01AI080192) and by a preclinical grant from Merck & Co., Inc., Kenilworth, NJ.